Choosing to be ourselves, joyful and consciously thriving is a dance! Staying in the dance of aliveness and conscious choice allows us to enjoy living more fully. Are you aware of the gifts that YOU bring to the dance? Would you like some tools to stay even more engaged with the Dance of Consciousness? 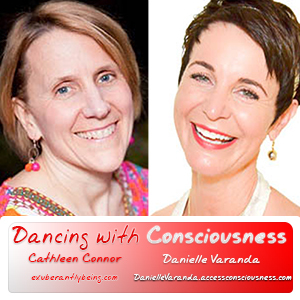 Access Consciousness Certified Facilitators, Authors, Speakers and Radio Show hosts Cathleen Connor and Danielle Varanda work internationally to share pragmatic tools for everyday questions, inspiration, and infinite possibilities to a more inspired, vibrant living. Is now the time to step even more fully into being YOU with dynamic ease, joy and confidence? As coaches and facilitators, Danielle and Cathleen inspire people to create their phenomenal life! Asking questions, becoming a partner with your yummy body, knowing that you know, and learning how to receive are all a part of the dance. What if all things are possible? Join us in the dance! OR shall we dance? OR Would you like to dance? Access Consciousness Certified Facilitators, Danielle and Cathleen, inspire people to create their lives and living as phenomenal. Inviting people to co-create with their body, empowering people to know what they know and being the question of what joy, what fun, what play could I dance with in my life today? Danielle Varanda is a Certified Access Facilitator, Certified Right Body For You Access Taster Facilitator as well as a contributing author of the best selling book “Possibilities of Parenting”. Danielle, known as the “Transformative, agent of magnitude”, has always been called to areas of transformation and for over 30 years has been the owner of Essential Jade specializing in skincare and nail care as a licensed esthetician and founder of International Feng Shui Design as a certified Blue Mountain Feng Shui consultant. Cathleen Connor is a Being You Class Facilitator along with an Access Consciousness and Body Process Certified Facilitator. She is a contributing author in the book Possibilities in Parenting. With the tools of Access, she loves to facilitate change for children and adults through bodywork, group classes, and 1 on 1 clearing and coaching sessions. Giving people the tools to know that they know and realize the GIFT that they are to create conscious change in their lives with joy and ease is her specialty. Giddy Up! How Can the Horses (and ALL livings things) Contribute to you! ?